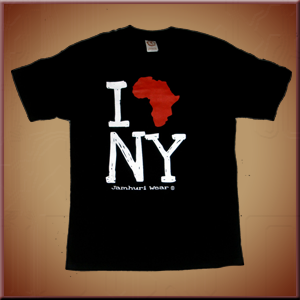 Jamhuri wear started in New York City in 2003 as a graphic tee shirt line. Jamhuri Wear's logo and name are inspired by the language and landscape of the continent that the brand strives to represent in the clothing world. The word "Jamhuri" translates from Swahili to mean "Republic" or "Free State." It describes the 53 vast nations of the company’s main focus. The company’s primary mission is to promote pride and empower the youth of Africa, playing a proactive part in the future image of "Mama Africa." Their past collections have showcased a mix between the contemporary and the traditional aspects of African society, heritage and cultures. Included in the collection is the "Badge of Honor" – a piece that evokes a Swahili prayer (and Kenyan national anthem) for peace that promotes tranquility and the growth of a nation. The "Tusker t-shirt" is a nostalgic piece that pays homage to the world-renowned African brew, while the "logo tee" bears the fiery, roaring red lion logo that represents all that is Jamhuri Wear - swagger, pride and power! The clothing line has recently grown to include custom cutting-edge outerwear pieces such as hoodies and crewnecks. Propelling it to be named Africa’s premiere street wear line, you can even find privately-owned buses (matatu's) in African Capitals toting the logo on their colorful graffiti-painted exteriors, previously reserved for mainstream brands like Nike, Bathing Ape and American entertainers. 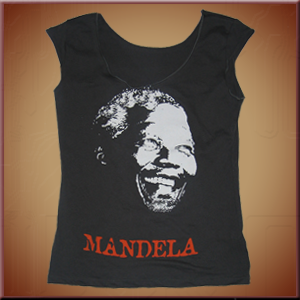 Other stand out Jamhuri Wear pieces bear testament to the past and honor heroes such as the Mau Mau freedom fighter Dedan Kimaathi, with the “5 Star General" Kimathi tee, and the inspirational leader Nelson Mandela, with the "Man-dela" t-shirt.Recently Jamhuri Wear has reached mainstream culture in the United States on account of popular entertainers wearing the brand, such as Akon, Damian Marley,K'naan and Tom Morello of Audio Slave. Hip-hop mogul Jay-z has often been seen wearing the label, notably during his UN-backed Global tour in Tanzania and during his Mega performance at the Live 8 concert in Philly with Linkin Park. In Europe and Africa itself, the brand has been promoted and furthered by homegrown Kenyan rap star Wawesh. Jamhuri Wear has also been featured in reputable fashion publications including Vibe, XXL, Complex magazine, Blow and Stuff magazine. Nice collection...Are you like me searching for some cool, trendy and happening stuff. Great! Then I am sure the link I am going to share with you – You are simply going to love it.